Don Berry was a high school and college football "star" and he was proud of his strength and manly good looks. 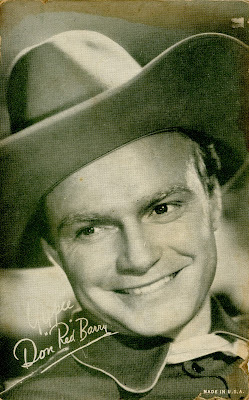 In 1940, just prior to the Second World War, "Red" Berry made it big in motion pictures as Red Ryder. Fame apparently wasn't good for him. Berry, while working at Republic Pictures in Studio City, had difficulty taking orders from people he viewed as lesser in importance. He was gradually relegated to secondary roles and viewed as a "B" actor. In 1980, Red Berry took his own life in North Hollywood.